I gave Line Dancing the good old college try. It was definitely a lot of fun. I called my Zumba classes back home in Normal, Grandma’s dance class. Well, this is just a continuation of dance class with quicker step changes. As in Zumba, we line up and follow the teacher. In both, the music is very important. The difference comes in how the steps are performed. Zumba works a full range of motion and steps or moves usually are repeated in sets of 8. In Line Dancing, the feet do all the work and balance is stressed with hands and posture adding style. Definitely a fun activity with fun participants. And of course, it requires practicing at the Music on the Patio Monday and Friday and the dance Thursday night (“Come Back Buddy”). Ray’s experience with shuffleboard was better than expected. Since he can’t see the end of the lanes, we were dubious at best at how this would work out. However, his years of bowling paid off. Since much of the objective is similar in that you have to get the ball/puck (or whatever you call it) down a lane and to land it strategically. Although not an instant success, he was pleased and went back for more during the ‘Pot Luck’ times (not tournament times). Organ Stop Pizza – Pizza is good, but the show stopper is the Wurlitzer theate r pipe organ. The organ and player slowly rise up out of the stage, slowly swiveling around so the whole audience gets a good view. The pipes take up an entire wall (about 100 feet). In addition there are a number of percussion and wind instruments that are played/directed by the player using designated keys on the organ. A relic of the silent film industry and not to be missed! 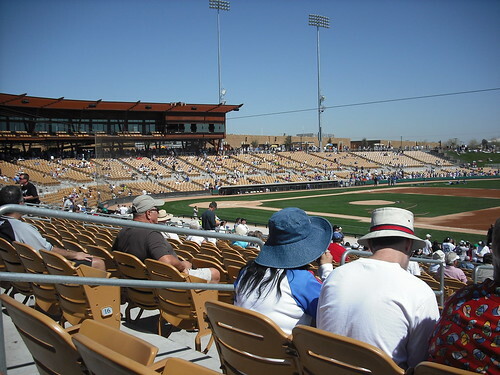 White Sox spring training at Camelback Ranch in Glendale. We bought tickets for a White Sox/Cubs game intending to go with our friends from Illinois but since they had to leave early this was another solo trip for us (amazingly Ticketmaster refunded two of the tickets on request). The ballpark was beautiful, the sun hot, the view good, parking easy. Unfortunately, my husband forgot that he is legally blind and couldn’t see most of the game. Plus he forgot his radio so he couldn’t check to see if there was any coverage. Then when leaving, there was a traffic snafu, so we detoured which took longer and ran into rush hour which took even longer. Lessons learned: find out if there’s radio coverage and take it with you; go out to eat after the game to avoid the traffic. 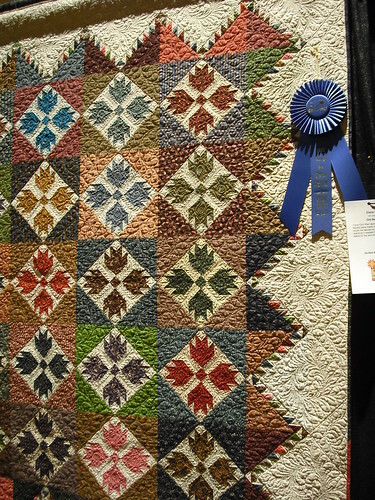 Both of these lessons we already knew, but you’d think we’d remember as well…..
Darlene Reid, “Crazy Quilts are the Gypsies of the Quilt World”. 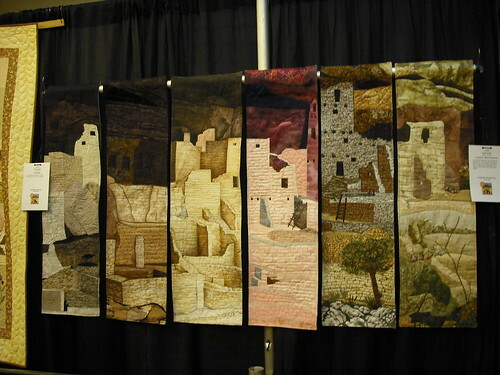 Crazy quilts are like a collage of fabric and momentos. Scotty dogs were popular in 30’s prints because President Roosevelt had a Scotty. Pins that have photos of long gone relatives on them (like campaign buttons today) make great embellishments. These were given out by funeral homes as mementos. Carrie Nelson, Miss Rosie’s Quilt Co, “Tips Tricks, and Tools for Better Piecing”. Use the same ruler for measuring and cutting throughout the whole quilt, Niagra non-aerosol spray starch is available at Target and good to stabilize fabrics. It’s OK to press to the light side (rather than dark which has been the rule) especially if this helps keep the seams flat. May need to trim the seam allowance of the darker fabric if it shows through. Well it took the whole first week to figure out where the multiple calendars of activities/ events were, how to get them, what to do with them, where everything happens, and who’s in charge. 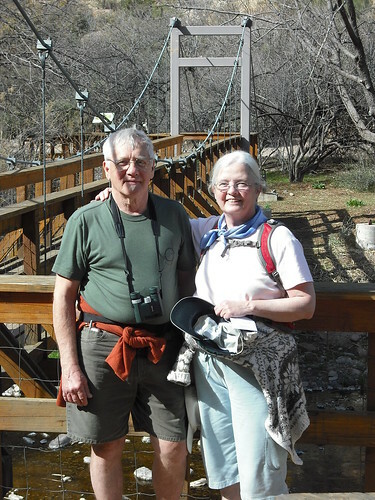 Favorite side trips organized by us: a visit to Tortilla Flats, a G old Mine, Boyce Thompson Arboretum. Tortilla Flats is a privately owned oddity. It started as a stage stop in 1904. Today besides a ‘museum;, their restaurant serves yummy burgers and HOT chili while serenaded by some very accomplished country musicians. 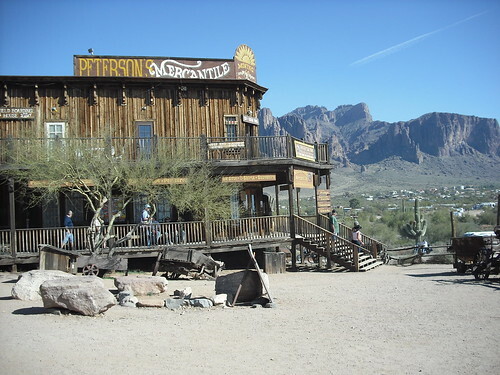 The Gold Mine is also a remnant of the old west complete with saloon, multiple little shops, a mine and the accompanying rail, and even a bordello. The Arboretum was really close, basically straight east through the Tonto National Forrest. It was amazing! They have a fantastic variety of indigenous plants. 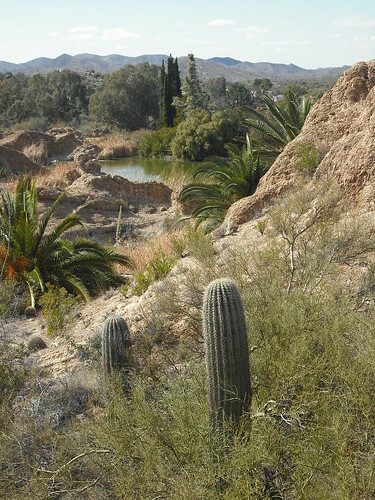 The initial motivation for the park was to provide a lab to research desert plants and their environment. The result is a great place to spend an hour or a day or two exploring the trails. I highly recommend adding this to your bucket list if you’re near Phoenix. Resort activities: bicycle ride, swimming pool, coffee and donuts each week, pancake breakfast, the quilting room, Tai Chi, music on the patio for happy hour and an ice cream social, and Texas Hold’em. What we didn’t do is a much longer list. Obviously, if you visit or live in a senior RV active resort, you need to focus on a couple of sports or classes for the first year, then look to expand in the future. Everyone I talk to says the first year or two is to absorb and learn the ropes. From then on, it’s as much fun as you can manage. We also have found that some RV resorts have better facilities in certain activities. For instance, one might have woodworkers, another jewelry including casting silver and lapidary, another might have gardening, stained glass, or sponsored trips. The trick is to talk with other seniors and explore other parks while you’re there. (February 9th – 12th): We drove from Minneapolis straight south to Oklahoma City which was still colder than you know what. 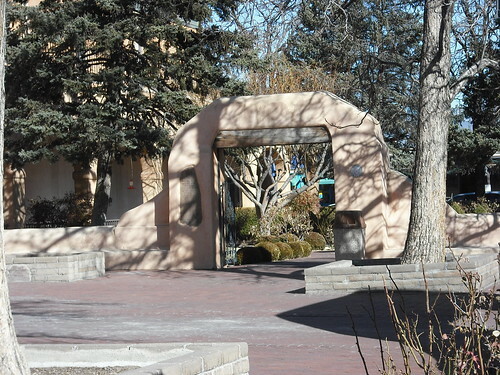 Finally on day 4 of our escape from the chilly North, Albuquerque promised highs in the 50’s. So we planned on spending a day seeing some of the town. Our hotel, Best Western Rio Grande, promised they were very close to museums and the Old Town. Perfect! Other exhibits not to miss: an extensive sculpture garden and an amazing collection of Colcha Embroidery. Practiced by Spanish colonials and handed down through generations, Colcha became a lost art until a renewed interest in the mid 19th century when they began to collect, catalog, and create anew these colorful bed, altar and table covers. 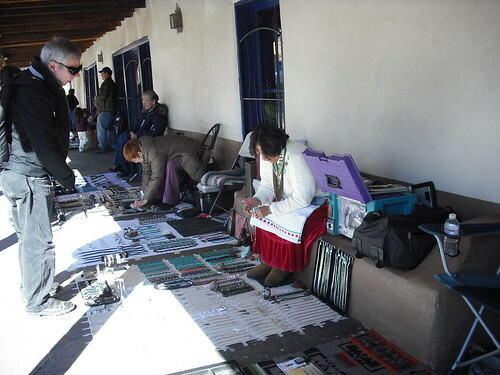 Colcha means a bed covering, but the colorful images were so popular, they were used for many other purposes as well. Rolling in Dough is a teeny tiny bakery with big results: there are amazing cookies (we tried the Italian Wedding Cookies), sweet rolls, and breads. To top it off, they have homemade soup so you can make a whole meal of it and take home breakfast, which we did! As Rachel would say, yumm-o. As much as I wasn’t happy about loooong driving days, I wanted to see more along the way. So we did. Taking our GPS, “Myrtle’s” suggestion (since I had programmed it for the shortest route, not the fastest), we headed south off US 40 on to New Mexico 117. This led us through the El Malpais National Monument and Apache Reservation before getting on US 60 for our final approach. What we encountered was some of the most spectacular scenery yet. It wasn’t quite a gravel road, but it was remote, isolated, and amazing. 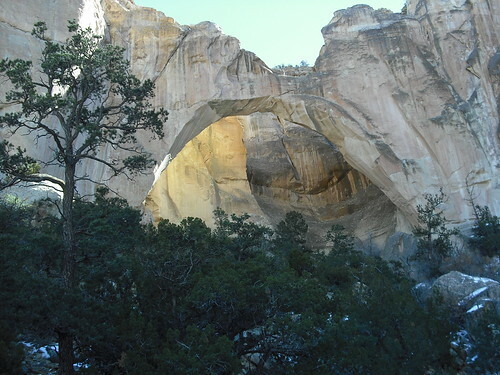 The highlight of this leg of the trip was the La Ventana (the window) Natural Arch in the Cebolla Wilderness. 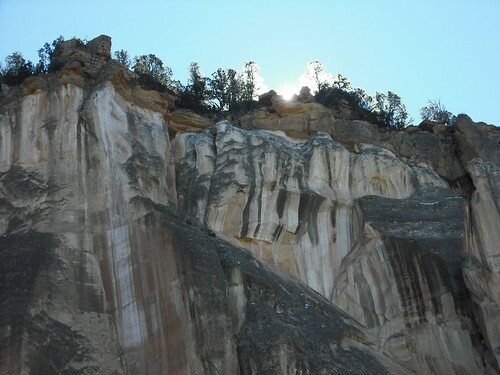 This area is managed by the Bureau of Land Management, El Malpais National Conservation Area. Finishing off the day of driving, we approached Mesa, AZ via the White Pine Mountains and Tonto National Forest. The first hour of driving was amazing, the second a bit more tiring but enjoyable. Finally arriving at Sun Life Resort, Mesa, AZ. This year we officially entered the real estate market with mixed emotions and results. Needless to say, the market was not cooperative and we are still Normal people for a while longer. That is, we live in Normal, IL. I can’t tell you how many open houses we’ve had. Each one required a certain level of mayhem and pandemonium during the preparation. In anticipation of one such event, I did a quick run through of the upstairs rooms. These are rooms I don’t normally visit since they are now devoid of human habitation and the associated detritus. On this occasion, I looked out the window and found a sizeable fish on the roof. Well, I says to myself, that’s a pretty athletic fish (imagining he had jumped/flew to the roof from the lake)! Obviously that couldn’t be the case, but that crow or hawk was pretty athletic themselves to have carried off the lift. Fortunately, it was dried up and not stinky anymore. So I cheerily opened the window and removed the carcass. We continue to comb through our ‘treasures’ in hopes of finding new and appreciative homes for them. We’ve had quite a bit of good luck with Craigslist and Freecycle and have even navigated around several scam attempts. The latest to go was our beautiful 9 foot lighted Christmas tree (used only twice, took a whole week to decorate each time!) to a young woman who’s never had one of her own before. We’re still looking for a home for our Civil War era walnut wardrobe with fantastic detail (including ivory keyholes). Know anyone? Our biggest success was the distribution of over 66 vintage glass lamp shades. This was my husband’s manic collection from over 40 years of garage sales. It started as a necessity to be able to replace lamp shades at the apartments we owned and rented out. But over the years it got out of hand. In order to find new homes for these, we spent several days running around our town (Old House Society, Habitat for Humanity warehouse, etc.). Then we did the same thing in Minneapolis with better results. All the lamp shades now reside at Architectural Antiques (a very neat place to find unusual architectural features for your home or garden). Basically we traded them ‘in kind’ and now have a huge credit with which to play. Our health is reasonably good for a couple of old f…s. Ray’s had a knee replacement, a broken ankle (yes, the blind guy was riding his bike), and ended up with a big toe joint replacement. I’m doing pretty good, going to Zumba Gold, swim and yoga when I can, quilt and knit, and otherwise make weak attempts at drawing and writing. This spring we’re going to try a retirement village in Mesa, Arizona for a couple months. I have mixed emotions about it, but I am very excited about exploring a part of the country I have only passed through for an educational conference. On my list to see so far are the Petrified Forrest, Mesa Verde, Grand Canyon. Best wishes to you and those close to you for the New Year.